Click here to go to the review page! Hello everyone just starting out in ham radio. Amateur radio is by far the best hobby in the world. Communicating with people around the world or across the street is all possible via ham radio. First off, you should decide if you would like to start with VHF (very high frequency) or HF (high frequency). The VHF bands are general used for local repeater use. Such as local nets, race communications and just plain talking to the locals. On the HF bands, world wide communications are usually an everyday occurrence on the 20-160 meter band. Each of these wonderful frequency bands have different test requirements which must be passed before you may use the band. Lets start with the VHF band. I enjoy VHF because it gives me a chance to kick back with my Icom hand held and talk with my friends and neighbors on the local repeaters. Running a PEP of .5 watts, I can easily talk to my friends anywhere with my rubber duck antenna via the local repeater. A repeater is used to take a transmission and re- transmit your signal out at a higher elevation and with about 50 watts of power. That is why repeaters are nice to have when you are using a hand held. FM or simplex is plain 2 way communication with out the means of a repeater. Simplex transmission ranges depends on the height of your antenna, what kind of antenna you are using and how much power is being used. At my qth, I use a 14 element beam vertically polarized running about 5 watts. My range is about 25 miles with a elevation of about 600 feet. Elevation plays a huge roll in the range of VHF communications. Buildings, rock piles and hills all take away some of your signal, that is why higher is better. If you decide to take part in vhf contests, you will normally find people on mountains with yagi or beam antennas for the maximum possible range. HF communication is a whole other world. A.K.A. the "world wide bands", HF is the place where you can work stations across the street or across the globe! I got started in HF with an old tube radio. Tube rigs are nice because they can with stand a high swr, which is nice if you should get a bad match in your antenna. Most tube rigs have analog dials, which means the frequency is written out on the dial or a movable disk in the center of the radio. Tube rigs average a price around $250. My first Swan 350 tube radio was only $100 and it worked just fine. Then, I purchased a Yaesu 101-E with a external VFO which digitally reads out the frequency you are on. Some problems with tube radios that you may encounter are "soft tubes", which means the final tubes which supply your rf power are getting burned out or are loosing their original power strength. You may notice that when you are tuning up, your power may only peak at 50 watts or less. This could be a sign of a bad antenna match, or soft tubes. Tubes are readily available from many companies for a very reasonable price. My current HF rig is the Kenwood TS-440S/AT. This is a solid state radio, which means it has not tubes and is all microchips and processors. The 440 has the built in automatic antenna tuner which with the push of a button will tune any antenna in about 6 seconds. I really enjoy this radio because of the digital display and it's small size. The 440 that I got was sold to me for a very good price at $670. Solid state rigs range any where from as low as $400-$6,885. That is a huger range! The rigs that are around $400 have the basic features and will work well as a mobile or base. The more expensive rigs have Digital Signal Processing, auto antenna tuners, filters galore and some even have built in oscilloscopes! However, don't let the expensive rigs get you down. Most hams cannot afford those big rigs and sometimes the smaller less expensive ones work better. Solid state rigs are more sensitive to high swr and voltage spikes. So you have to remember, the more expensive the rig, the more you have to be careful with. A static spike from lightning may cause a solid state radio to blow a circuit and be non usable until repaired, yet it may not harm a tube radio. Lightning protection is very important for any rig and antenna setup that you have. If you own or are going to purchase a solid state radio, I would highly recommend an in- line gas discharge coaxial surge protector from Alpha-Delta or Cushcraft. This will take any spikes from power lines or lightning in your coax and put it into the ground via a ground rod. It will protect any surges from entering your shack and ruining your radio. Tube rigs can get by with the less expensive air gap type arresters because they are less sensitive than solid state rigs. Grounding your antennas, radio's and power supplies are essential for a safe and well working ham shack. Antennas weather it be for VHF or HF play a huge roll in the range of your communications. A beam or Yagi antenna will direct your signal in the direction your antenna is pointing. To effectively use a beam antenna, an antenna rotor must be used to turn your antenna to a North, South, East or West position in the direction you want to talk to. Other types of antennas are vertical, which generate your signal in a 360 degree pattern. These antennas are the most versatile and easiest to put up and will work without a rotor. A dipole antenna is a long wire antenna that uses a balun or transformer to match the antenna to its designed frequency(s). I use a G5-RV dipole here for 80-10 meters on HF. The antenna is 31 feet above the ground, which is a full wave length on 10 meters. It works excellent and I can make contacts just about any where in the world when the conditions are good. A dipole can be put up between trees, across the roof or just about anywhere that has enough room! You can fold them back or zig zag them to take up less space, and you can also make what is called an inverted V which will perform very well on the bands. 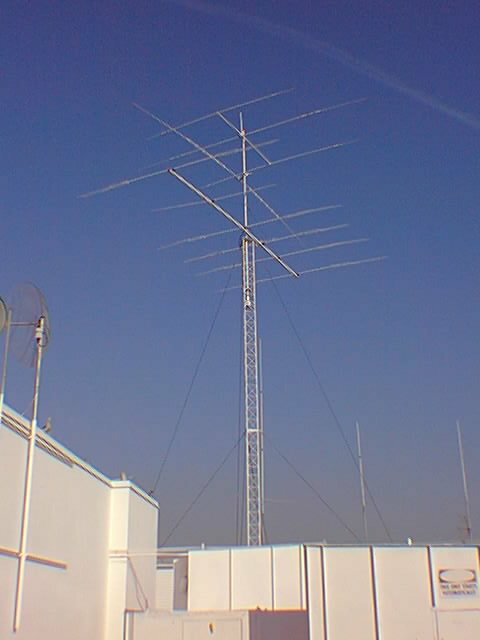 Which ever antenna you decide to buy, make sure you will have the room and if it is a large beam for HF, you need a tower because of the wind drag that the large elements will have. Just remember, most any antenna will work well, choose which is right for you!